Add a touch of natural beauty to your patio or pool area with this Balau hardwood dining set by International Caravan Home Furnishings. 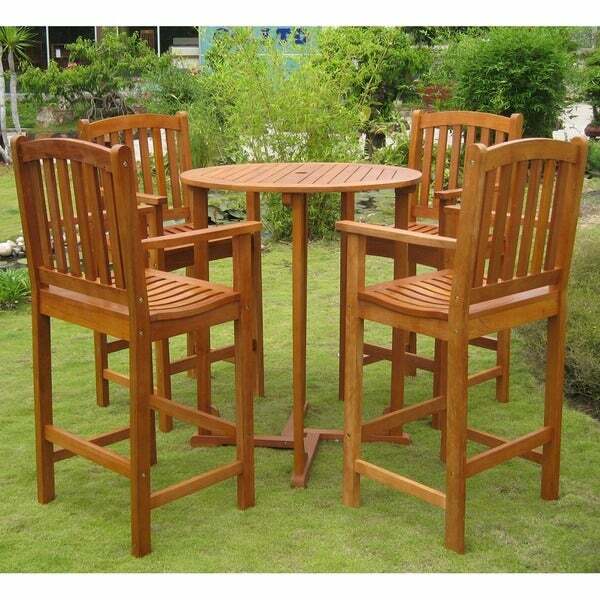 Constructed of solid balau hardwood, this outdoor dining set is durable and beautiful, boasting natural coloring. The set is bar-height, offering a unique aspect to your dining experience. The set is weather resistant and UV protected for long-term use. An excellent place to relax or to entertain friends, this outdoor dining set features a natural wood finish that looks great when placed on a patio or deck. The set is weather resistant and designed with UV protection, so you can leave it exposed to the elements without worrying about damage or weathering. Very happy with purchase. Furniture was delivered in less than a week. My daughter assembled the table and 4 chairs herself with the allen wrench provided. It took her 5 hours, but the end result was great. Would definitely purchase from this manufacturer again. My husband and I just bought this beautiful teak outdoor dining set for our FL beach house. We can not be more pleased with the look, the quality and the sturdiness of this set. It looks perfect in its new home on our 2nd floor balcony. Our renters are going to love it! After years of waiting we finally found the bar height table and chairs we'd longed for. We have a gorgeous view of the lake and surrounding mountains in North Idaho and this set is the perfect fit. We had shopped for years, but found too many overpriced and poorly constructed. This set will not disappoint, folks. Look no further! A little assembly is required, but worth it. One of the chairs had a crack in the arm and Overstock responded quickly by sending a new chair. I love this for our beachfront condo deck, we can finally see over the railing! Have been waiting for a set like this for a long time. Glad we made this purchase! Two days after I purchased this set (four chairs and a table) I found that I could have purchased two sets of two chairs and the table separately for about $$$ less. I would like at least a 30 day price protection policy. I'm not sure about this review yet. I got the set last summer.. It looked beautiful on our new deck. Unfortunately I was sitting on the chair and one of the rails split in half. I am 135 pounds so I don't think it was my weight. I asked my husband to fix it and he said it shouldn't broke for $***. We packed that chair up and put it away for the rest of the summer. Last weekend we decided to pull out the furniture and put it back onto the deck because we had a beautiful weekend. I was so disappointed to be short one chair. I just wrote to overstock.com to see if they would possibly replace it. Still waiting for the answer. So the verdict is still out for this set. We live on beach with wind and weather and this has worked so well. The table and chairs are very sturdy and heavy. This came within a week of ordering. The assembly was quite easy with only 2 snags. First, one hole was not propertly drilled so my husband had to do it and sencondly, the final chair was missing 4 screws. I called Overstock and they could not get the parts from the company so they gave me a nice credit! Absolutely no complaints there as we found the screws at a small hardware store in our area. The set was not cheap but we needed something durable and heavy as we are on the water and the winds get very strong. It was very sturdy and exactly what we wanted since the metals get pitted and blow over in the wind and salt air. Worth the effort for the assebmbly and the $. Unfortunately two of the chairs was damaged on arrival. Difficult to assemble. Table needs leg support. Looks nice, but was a little difficult to put together. Instructions are not very clear. Also, wood is splitting due to rain/heat. It's like the wood expanded and splits. Okay, but not sure worth the price. Bought a cover for it so we'll see if that helps. beautiful and made very well! Its nice looking. The chairs are extremely heavy. Once seated its hard to scootch them over to the table. The table slats are warping already. And the chairs are growing mildew. and its only been a few weeks so far!! Not worth the price, IMHO. Love this set. It was easy to assemble just time consuming. I did it as my husband was out of town. It is beautiful and comfortable. "What is maximum person weight for these bar stools??? Thanks." "How high is the actual seat off the ground? No description on this fact. Thank you!!" "How high off the ground is the actual seat of a chair? Thx"
"Do you see a waterproof cover for this table and chairs?" "How do I buy extra bar stools?" We do not currently have extra bar stools available separate from the set. "46 lbs for a chair? Has anyone had issues scotting themselves to the table in this chair?" Hello Kate, we can appreciate the fact you want a firsthand account of the product. You will receive an email notification every time you get a response. Thank you for shopping with us.